Curicó ([kuˈriko]), meaning "Black Waters" in Mapudungun (originally meaning "Land of Black Water"), is the capital city of the Curicó Province, part of the Maule Region in Chile's central valley. The province lies between the provinces of Colchagua and Talca and extends from the Pacific to the Argentine frontier. Its cakes, fruits, and wine are well known in Chile and around the world for their high quality. According to the 2012 census of the National Statistics Institute, Curicó spans an area of 1,328.4 km2 (513 sq mi) and has 147,017 inhabitants (68,768 men and 70,817 women). Of these, 130,506 (84%) lived in urban areas and 19,079 (16%) in rural areas. Between the 1992 and 2002 censuses, the population grew by 14.9% (15,472 persons). Curicó is on the Guaiquillo River, 183 km (114 mi) south of Santiago along the route of the Chilean Central Railway. 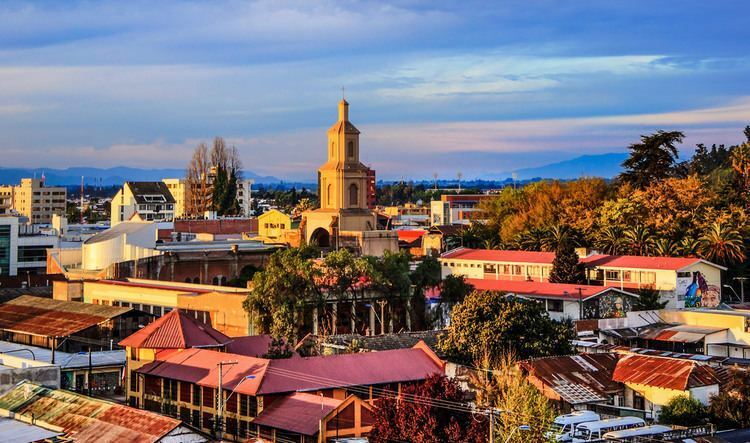 The city is situated in the fertile Chilean Central Valley, 228 m (748 ft) above sea-level, in the midst of a comparatively well-cultivated region. The eastern and western sides are mountainous, separated by the Chilean Central Valley. The commune spans an area of1,328.4 km2 (513 sq mi). Mineral resources are undeveloped, but are said to include copper, gold and silver. Cattle, wheat and wine are the principal products, but Indian corn and fruit also are produced. On the coast are important salt-producing industries. The main rivers are the Lontué River and Teno River, which surround the city. The landscape is dominated by the Andes and Chilean Coastal Range. Curicó has a mild Mediterranean climate: relatively hot dry summers (November to March) with temperatures reaching 32 °C (90 °F) on the hottest days. Winters (June to August) are more humid, with typical maximum daily temperatures of 15 °C (59 °F). Mean rainfall is 855.98 mm (34 in) per year. In August 2007, Curicó experienced snowfall for the first time in over 60 years. In the southern part of the valley the climate is more temperate and rainfall more abundant; the effects of this are to be seen in better pasturage. Irrigation is used to a large extent. Curicó was founded in 1743 by Jose Manso de Velasco during the Spanish reign in the Americas (see Captaincy General of Chile). It is one of the more cultured and progressive provincial towns of Chile. In 1747, Governor Domingo Ortiz de Rozas decided to move it about 5 km (3 mi) to the north, where it is now located, because of the humidity in its original location. The oldest and most valuable building of the city is La Iglesia San Francisco (San Francisco's Church), built in 1734, and came to its current location in 1759. 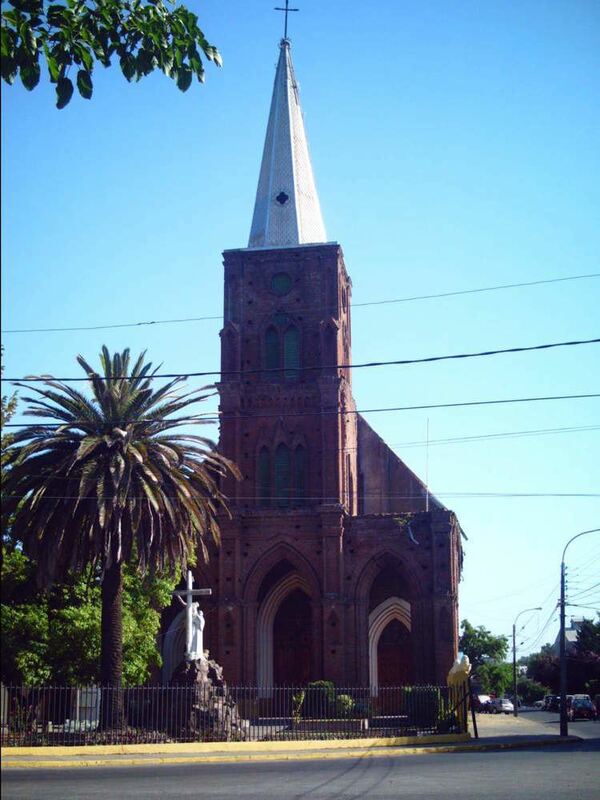 Curicó gained the title of "city" in 1830. The city's hero is Luis Cruz Martínez, a Chilean soldier from the War of the Pacific, who died in 1882 in Perú. The city was destroyed by an earthquake in 1928 and rebuilt during the following year. Today, Curicó is a center of communication, supply and commercial transactions of neighboring agricultural industries, making it an attractive and buoyant commercial center. The city's economy is based mainly on agriculture, because the Mediterranean climate creates comparative advantages with markets such as apples, wines, and cherries. The major industries are wine, agroindustries, stand out cement and sugar. The economic force of the vineyards generates development and investment for the city. 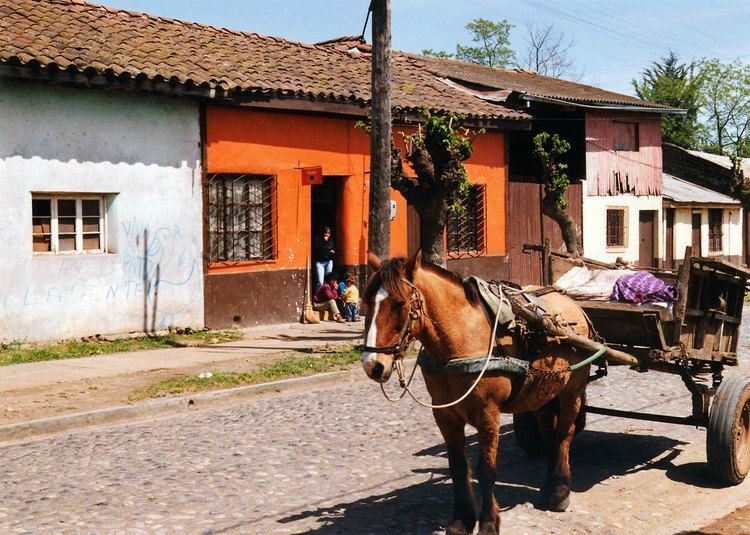 In human development the city had 0.716 (UNDP, Chile 2000), reaching the 97th position in the municipalities of Chile . An interesting feature of the city is its wine culture. It is reflected in a number of ways, for example, between March 15 and 20 each year, the city celebrates a large wine celebration, the Fiesta de la Vendimia (Wine Harvest Festival). Furthermore, the region has its own tourist circuit, La Ruta del Vino (The Wine Route), in Curicó Valley. Potrero Grande is a popular attraction for tourists and locals alike. It is a mountainous area with large forests and waterfalls, located about 30 km (19 mi) from Curicó. The rivers around Curicó are excellent for trekking. It is known in the country as "the city of cakes" (many cakes are made there from manjar, meringue and fruit), and is known for its wine. The Plaza de Armas (Main Square) is the most visited public place (declared a "Typical Zone"), and it is now a tourist destination because of its 60 palms and exotic plants, sculpture-ornamented water fountains, and the iron-made civil kiosks. There is a steel kiosk which is a historical and cultural monument. There is also a monument to Lautaro carved on the trunk of a beech tree, created by the famous craftsman of Vichuquén, Heraclio "Kako" Calquín. Located around Plaza de Armas are the mayor's house (alcaldía) and the governor's house. A few blocks from the plaza, the Alameda Antonio Manso de Velasco avenue crosses the city with its gardens and leafy trees. There is also the Condell hill, a place which offers a panoramic view of the city and the San Francisco church, a declared national monument, located near Condell hill. Curicó is known for its bicycle culture, and is represented in the denomination of Curicó as cyclism's capital of Chile, because so many cyclists of international level started riding in the city, such as Roberto Muñoz, Manuel Aravena, Marco Arriagada, Marcelo Arriagada and Luis Fernando Sepúlveda. Kayak and whitewater rafting adventurers from all over the world visit the popular Teno River located in Curicó's mountain town of Los Queñes. Today the city is living a great revolution with the return, (after 13 years in the amateur league) of its football team to the professional league in 2006. The name of this team is Club Provincial Curicó Unido. Furthermore, in Chilean sports, the rodeo is too figurative in the national competitions, stand out the horsemen such as Ramon Cardemil, and Pablo Quera. As a commune, Curicó is a third-level administrative division of Chile administered by a municipal council, headed by an alcalde who is directly elected every four years. Currently, the 2012-2016 alcalde is Javier Muñoz Riquelme. Within the electoral divisions of Chile, Curicó is represented in the Chamber of Deputies by Mr. Roberto León (PDC) and Mr. Celso Morales (UDI) as part of the 36th electoral district, (together with Teno, Romeral, Molina, Sagrada Familia, Hualañé, Licantén, Vichuquén and Rauco). The commune is represented in the Senate by Juan Antonio Coloma Correa (UDI) and Andrés Zaldívar Larraín (PDC) as part of the 10th senatorial constituency (Maule-North).